What is the reason behind constructing nanocomposite for the photocatalytic oxidation desulfurization? 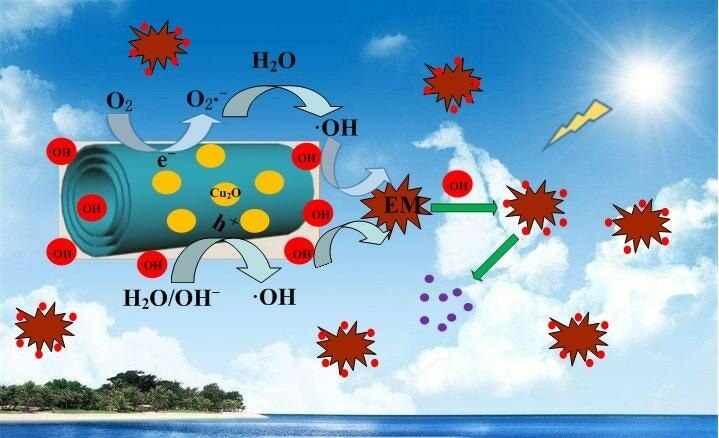 The suggested mechanism of photocatalytic oxidization of EM over Cu2O-H2Ti3O7 nanocomposite under sunlight irradiation. Under the sunlight irradiation, photo-generated electrons (e?) of nanocomposite aggregated on nanotubes, and holes (h?) aggregated on Cu2O nanoparticles, which will reduce the bandgap energy and prolong the effective separation of photo-induced electron-hole pairs, enhance eventually the photocatalytic activity. It causes a large number of the hydroxy radical groups (·OH) generated on nanocomposite, which will effectively oxidize EM due to the synergistic effect between them to form heterojunction structure. Therefore, nanocomposite exhibits the excellent photocatalytic performance. CREDIT: NANO Journal. With current hydrodesulfurization (HDS) technology it is hard to remove thiols and refractory thiophenic compounds to a minimum in fuels. Furthermore, the HDS technique requires severe operation conditions, along with other disadvantages in deep desulfurization. Hence, significant focus has been paid to non-HDS methods such as biodesulfurization, adsorption, photocatalytic oxidation and so on. Of all these, the photocatalytic oxidation desulfurization is the most ideal “green chemistry” technique for performing deep desulfurization with mild operating conditions. A few Researchers have described nanocomposite as an effective photocatalytic functional material than just the host, for example, Nb6O17-Fe2O3, Cu2O-TiO2 nanotube arrays, etc. The high photocatalytic activity of the titanate nanotubes under UV light irradiation has made it a material of choice. Yet, titanates have a comparatively wide band gap and are used only under UV light, thereby restricting their photocatalytic activity. Furthermore, while using only Cu2O as a photocatalyst, the holes and electrons excited by light are not effectively transferred and can readily recombine with each other. A few research teams adapted a novel idea and composited Cu2O nanoparticles by using titanate nanotubes, leading to wider absorbance and intense visible spectral response. This approach offers an innovative way to minimize the band gap energy and extend the dissociation between photo-generated electron-hole pairs, which resulted in better photocatalytic activities for photodegradation of organic pollutants more thoroughly. The most remarkable feature of this research is that when Cu2O nanoparticles were composted by using H2Ti3O7 nanotubes as an effective photocatalyst used for desulfurization, the construction as well as desulfurization application of these functional materials was hardly described in earlier studies. Initially, the photocatalytic oxidation desulfurization is taken to be the best suited “green chemistry” technique for deep desulfurization with moderate operating conditions when compared to the prevalent HDS techniques. Then, the trititanate nanotubes are constructed. Earlier studies have showed that certain layered titanates were found to be good photocatalysts, and the corresponding nanotubes and nanosheets even demonstrated considerably greater photocatalytic activities when compared to the original layered compound. Moreover, the Cu2O-H2Ti3O7 nanocomposite has been synthesized such that the mesoporous nanoscroll composites have evidently greater photocatalytic activities when compared to host layered materials or guest oxide nanoparticles taken alone. The research suggests that apart from reducing the bandgap, the layered materials doped with guest nanoparticles can also prevent the photoinduced electron-hole pairs from getting recombined. Hence, in this study, Cu2O nanoparticles integrated H2Ti3O7 nanotubes have been used by means of a facile hydrothermal technique, demonstrating that nanocomposite has exceptional photocatalytic performance owing to its wider absorbance and stronger visible spectral response. This study can become the basis for developing innovative energy resources (solar energy) and oxidizing organic pollutants for protecting the environment.